Turkish President Erdogan warned against so-called “sea bandits”. He was speaking in regards to the controversial issue of energy exploration in disputed Aegean and Eastern Mediterranean territories along his country’s maritime borders with Greece and Cyprus, the latter of which is comprised of a northeastern third that declared itself the “Turkish Republic of Northern Cyprus” and is only recognized by Ankara. The Turkish leader threatened that his country “will not allow bandits in the seas to roam free just like we made the terrorists in Syria pay”, which strongly implies its intentions to militarily defend it and its ally’s interests against the much weaker forces of Greece and Cyprus, despite the first-mentioned being a “fellow” member of NATO. It’s more than likely bluster at this point, but his eyebrow-raising rhetoric draws attention to some very important trends. The first is that maritime tensions along Turkey’s western and southern peripheries have been heating up, partially due to Israel’s prospective plans to build an “EastMed” gas pipeline connecting the self-proclaimed “Jewish State” with Italy via Cyprus and Greece. Not only could drilling take place off of the divided island, but its internationally recognized government could also receive a windfall of revenue by facilitating this pipeline’s transit across its maritime territory, funds that might be withheld from the northeastern region pending an official resolution of the conflict on Nicosia’s terms. President Erdogan understands just how closely connected the topics of Cyprus’ reunification and its energy geopolitics are, hence why he’s taking such a strong stand at this time in a bid to help his ally gain better negotiating leverage. The second trend that President Erdogan’s polemics seem to address is the increasing sense that his country is being “contained” along its maritime and mainland borders, the first of which was just touched upon while the second deals with the Syrian Kurds and Armenia. It’s well known that Ankara regards the PYG-YPG as terrorists and has militarily intervened against them twice in Syria, while there’s a looming unease that the new pro-Western Color Revolutionary government of Nikol Pashinyan in Armenia might move uncomfortably closer to the US in the coming future. This fear was heightened after US National Security Advisor John Bolton praised the quality of American arms while visiting Armenia late last month, which made some worry that Washington is trying to militarily court Yerevan despite Armenia denying it. 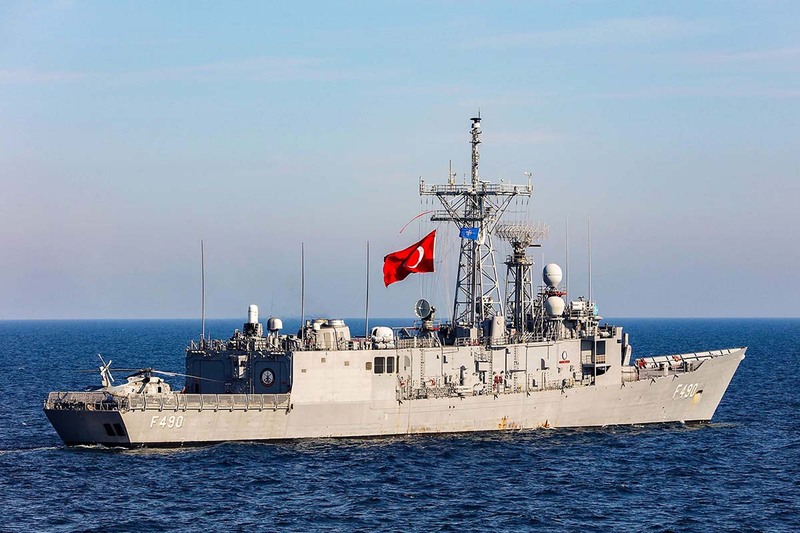 Altogether, Turkey’s threats against so-called “sea bandits” lurking in the Aegean and Eastern Mediterranean can therefore be interpreted as a reaction against what its government tacitly regards as an ongoing “strategy of tension” all along its maritime and mainland borders. Turkey is beginning to feel like its notional American “ally” is “containing” it despite the incipient rapprochement that the two Great Powers are presently involved in, and it thinks that blustering against what it suspects are the US-backed plans of its Greek and Cypriot neighbors will scare them off and succeed in calling the US’ bluff. The situation is becoming ever more unpredictable and dangerous as Washington and Ankara jostle for influence in the Turkish borderlands, thereby raising the risk of a proxy war by either miscalculation or design.